At the Battle of Muret on 12 September 1213 the Crusader army of Simon IV de Montfort defeated the Catharist, Aragonese and Catalan forces of Peter II of Aragon, at Muret near Toulouse. Simon IV de Montfort was the leader of the Albigensian Crusade to destroy the Cathar heresy and incidentally to join the Languedoc to the crown of France. He invaded Toulouse and exiled its count, Raymond VI. Count Raymond sought assistance from his brother-in-law, King Peter II of Aragon, who felt threatened by Montfort's conquests in Languedoc. He decided to cross the Pyrenees and deal with Montfort at Muret. On 10 September, Peter's army arrived at Muret, and was joined by a Toulousain militia. He chose to position his army so their right flank was protected by the Saudrune River, and the left protected by a marsh. He left the Toulousain militia to assault the walls of the city. Simon de Montfort led an army of 1,000–1,700 French Crusaders, including a small contingent of knights brought by his ally, the Viscount of Corbeil. 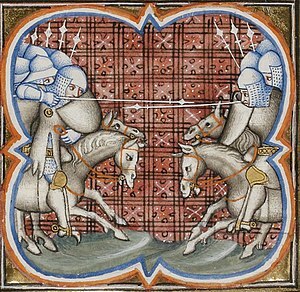 Montfort had 900 cavalry, of which 260 were knights. His 300–700 infantry stayed behind at Muret to hold the town and tie down the Toulousain militia. Peter of Aragon had brought 800 to 1,000 Aragonese cavalry, joined by a militia of 2,000–4,000 infantry from Toulouse and cavalry from the counts of Comminges and Foix. Peter's combined forces possibly numbered 2,000 cavalry and 2,000–4,000 infantry. Montfort led his knights and horse sergeants out of the walled town and divided his cavalry army into three lines, with his half-brother William of Barres commanding the first line and Montfort himself commanding the third for purposes of tactical command and control. King Peter had arranged his men in the same formation, with the Count of Foix commanding the first line and the King disguising himself in a borrowed suit of armor in the second line. Once deployed, Peter's army remained stationary and waited for the Crusaders' approach. Crossing a stream, William of Barres' cavalry rode for the center of the Count of Foix's line, with the second Crusader line following him. The coalition's first line was crushed by the impetus of the charge and the Crusaders broke through to the second. At the same time, Montfort maneuvered his unit to outflank the coalition cavalry from the left and crashed into them. Confused and disorganized, the coalition cavalrymen began to retreat. King Peter may have been killed in the initial clash or the Crusaders may have headed for his standard in the second line during the battle, seeking to kill him. According to one contemporary account, he shouted "I am the king! ", but was not heard. Knowledge of his death contributed to the rout of his army. Montfort's first two lines pursued the defeated coalition cavalry, while Montfort himself rallied his third line and kept them in reserve in case the pursuers encountered resistance. This proved unnecessary, as the fleeing cavalrymen put up no such effort. Montfort then returned to the besieged Muret. The militia from Toulouse renewed their assault on the city. When they saw the Crusader horsemen returning and learned that King Peter of Aragon had been killed they broke and fled their fortified camp toward the Garonne River. They were slaughtered in the rout. This would be the last major battle of the Albigensian crusade. ^ a b Marvin 2009, p. 185. ^ a b Marvin 2009, pp. 186–187. ^ Alvira Cabrer, 2008, págs. 206-208. ^ Marvin 2009, pp. 192. ^ Also called Murel, Murell, or Morel. ^ a b c Marvin 2009, p. 188. ^ a b Marvin 2009, p. 189. ^ Marvin 2009, pp. 189-190. ^ a b Tucker 2010, p. 269. ^ Marvin 2009, pp. 175-195. Marvin, Laurence W. (2009). The Occitan War: A Military and Political History of the Albigensian Crusade, 1209-1218. Cambridge, UK: Cambridge University Press. ISBN 978-0521123655. Guillaume de Puylaurens (2003). Silby, W.A. ; Silby, M.D. (eds.). The Chronicle of William of Puylaurens: The Albigensian Crusade and its Aftermath. Suffolk, UK: Boydell & Brewer. ISBN 0-85115-925-7.